Since Star Wars Rebels is canon, it’s always a big deal when they introduce a new character. This is a person, creature or droid that will now forever be a part of Star Wars lore and, in the latest episode, they introduced a good one: Female bounty hunter Ketsu Onyo, voiced by Gina Torres. 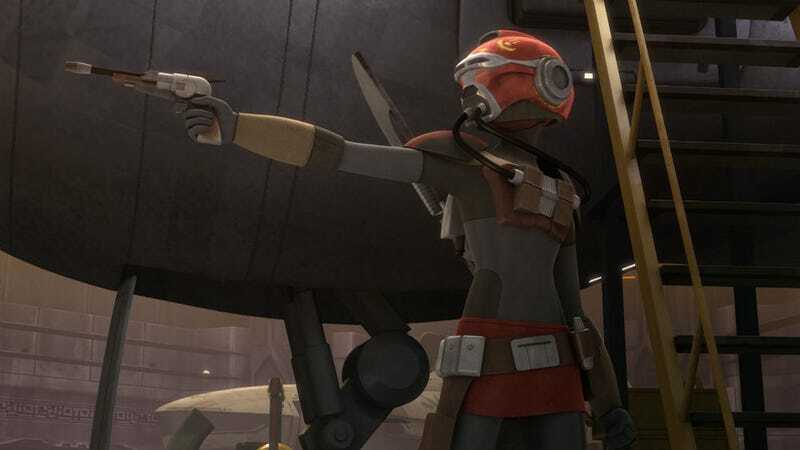 To genre fans, Torres is best known as Zoe from Firefly and Serenity, and her addition gave Rebels a big dose that classic Joss Whedon, rapid fire, back and forth banter between Ketsu and and her old friend Sabine Wren. In the episode, called Blood Sisters, newly minted Captain Hera gives Sabine a mission. She’s to make contact with a spy and transport the spy to a secret location. It takes a while but she and Ezra–who tags along because he kind of has a crush on Sabine–find the spy. It’s a gonk droid, EG-86. Things are going smoothly until Ketsu arrives. We find out that she and Sabine used to be great friends, until Ketsu left Sabine for dead on a mission. The two battle verbally, and then with blasters, as the Empire gets wind that’s something going on. Luckily, Sabine escapes with the spy, but Ketsu is in hot pursuit. Awesome cameo alert. The transport ship Sabine steals to escape was piloted by Captain Rex, the original pilot of the theme park ride Star Tours. Was this a canon appearance of Star Tours in the Star Wars universe? Maybe, and even if it’s not, it was a nice wink to fans. Rebels loves that. Out in space, Ketsu follows in her Ghost/Y-Wing mashup ship called The Shadowcaster. Again, she and Sabine go back and forth like old friends until, finally, circumstances force the now enemies to once again realign. Together, with a huge dose of help from Chopper, they escape the Empire and get the spy to its destination: the planet Alderaan, where R2-D2 is waiting on behalf of Bail Organa. That sounds familiar, right? A droid with plans in it has been delivered to R2-D2 for an Organa? Sounds a lot like the opening of A New Hope, but this episode was definitely not Rogue One. These were other, much less important, plans. But maybe, just maybe, this was some kind of trial run. Much like last week’s episode, which focused on Hera, this Sabine-centric episode didn’t quite move the overall story forward. But it’s really exciting to continue to learn more and more about these characters. Sabine was training to be part of a group of hired assassins and bounty hunters called the Black Sun, a group that Ketsu is now a part of. How did she get to that point? Will we get to see how and why she left to come to the Rebels? Eventually, I’m sure we’ll find out.